When I bought the Defender, the front suspension was very bad. As the front suspension needed to be replaced, it made a lot of sense to do the rear at the same time. I was putting TerraFirma stuff on the front, I decided to install the TerraFirma Big-Bore Expedition shocks on the rear. This damper provides good performance for heavily laden vehicles that travel across very rough terrain. They shouldn’t struggle at all with what I ask them to do. Fitting the rear suspension is much easier than the front. The steps below show what I did to upgrade the rear suspension. 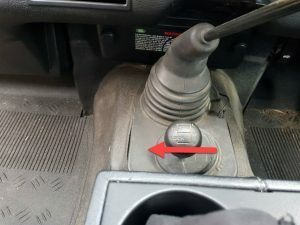 This information is not meant to be used by others as a guide on how to perform this upgrade, it just purely documents what I did to my own vehicle. As the car is to be jacked up and the wheel removed, the following basic steps were taken to make sure the car is as safe and stable as possible during the work. Check your own car’s documentation to make sure you are following all the steps necessary if you are performing this work yourself. 1). Engage the Center Diff Lock and make sure the dash light is lit. 3). Jack up the rear of the car. 2). Chock the front wheel, as the rear ones are being worked on. 4). Support the car with axle stands placed securely on the chassis. 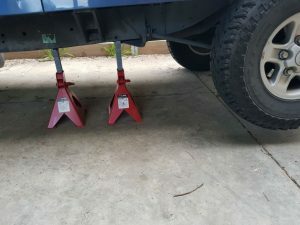 Once the car is jacked up and the wheel removed, a trolley jack is used to take the weight of the rear axle on the side of the car that you are working on. The Jack is used to support the axle once the damper is removed. The existing suspension components were very used and had definitely seen better days. Like the front, there were no makers logo or any identification on them so I donít know who had manufactured them. Looking at the condition of the existing suspension, I was very happy with my decision to replace it with new items. 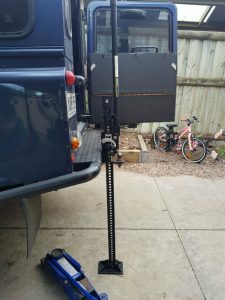 I made sure the trolley jack was taking the weight of the axle, I removed the top and bottom nuts and bolts holding the damper in place and then removed the damper itself. 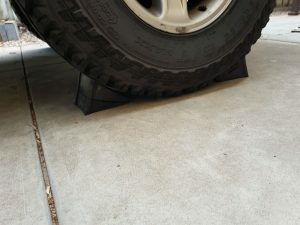 Slowly I lowered the trolley jack until the spring became loose in its mountings. The retainer was unbolted and with a little wiggling about, the spring was removed. The new springs and dampers are considerably more serious looking when compared to the old equipment I was removing. 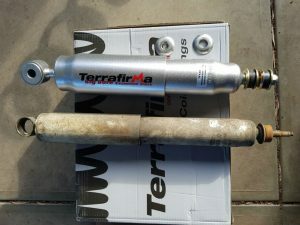 The photos don’t do them credit but the new TerraFirma dampers were nearly twice the diameter of the old ones that I were removing. At their widest part they are around the 78mm diameter mark. 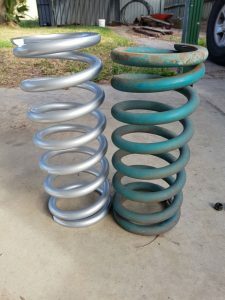 The springs were nearly an inch taller than the ones and were made out of thicker material. The new spring and its retainer were fitted first and the axle lifted by using the trolley jack. The new damper was then fitted. 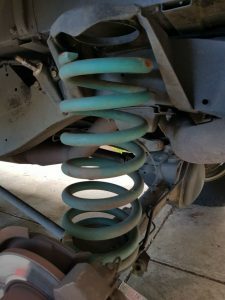 Apart from some minor trimming to the lower bracket holding the bottom of the shock, this was a very straight forward job. Once the new equipment and the wheel were fitted, the car was lowered and all the new and affected fittings were tightened to the correct torque settings that I looked up in the workshop manual. I think the new suspension looks great! The wheel was put back onto the car and the process was repeated on the opposite side of the axle. In total, the entire job only took a couple of hours to complete. I would definitely think that this is a job that I would do again myself when the time comes. As long as you take you time, do the research and do all the things that keep you safe, the job itself is relatively easy to do. 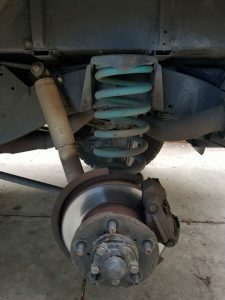 I have used the car off road and over corrugations and the new suspension works very well. I’m very impressed with the TerraFirma equipment that I have added to the Defender.